I think one of the greatest things about my job is discovering a new use for elements that we see everyday, such as plexiglass. I am currently working on a few projects with heavy use of clear materials, such as glass and plexiglass, and we are currently exploring different ways to construct and use this material. 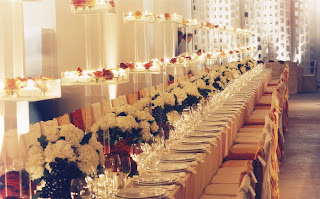 One great idea I found was this beautiful long table effect with tall tiered plexiglass structures. How beautiful!